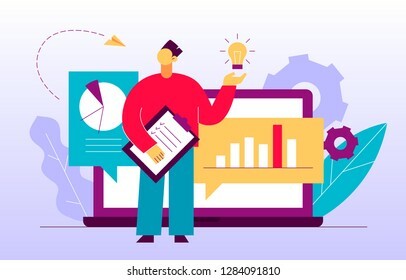 Vector illustration in rank M-rank: Vector flat style business and finance design concept with big modern people, man holding idea light bulb. Trendy brainstorming illustration with cogs, graphs, diagrams, paper plane, leaves. Vector flat style business and finance design concept with big modern people, man holding idea light bulb. Trendy brainstorming illustration with cogs, graphs, diagrams, paper plane, leaves.